July 13, 2017 Pawtucket Red Sox released 3B Jhonny Peralta. 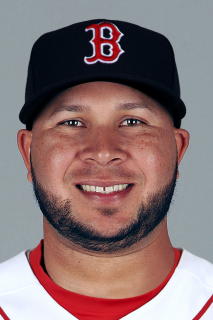 June 28, 2017 3B Jhonny Peralta assigned to Pawtucket Red Sox. June 23, 2017 Boston Red Sox signed free agent 3B Jhonny Peralta to a minor league contract. June 13, 2017 St. Louis Cardinals released 3B Jhonny Peralta. June 9, 2017 St. Louis Cardinals designated 3B Jhonny Peralta for assignment. May 19, 2017 St. Louis Cardinals activated 3B Jhonny Peralta from the 10-day disabled list. May 14, 2017 St. Louis Cardinals sent SS Jhonny Peralta on a rehab assignment to Memphis Redbirds. May 5, 2017 St. Louis Cardinals sent SS Jhonny Peralta on a rehab assignment to Palm Beach Cardinals. April 20, 2017 St. Louis Cardinals placed 3B Jhonny Peralta on the 10-day disabled list. Upper respiratory illness. August 2, 2016 St. Louis Cardinals activated 3B Jhonny Peralta from the 15-day disabled list. July 31, 2016 St. Louis Cardinals sent SS Jhonny Peralta on a rehab assignment to Palm Beach Cardinals. July 19, 2016 St. Louis Cardinals placed SS Jhonny Peralta on the 15-day disabled list retroactive to July 18, 2016. Ligament strain in his left thumb. June 7, 2016 St. Louis Cardinals activated SS Jhonny Peralta from the 15-day disabled list. June 3, 2016 St. Louis Cardinals sent SS Jhonny Peralta on a rehab assignment to Palm Beach Cardinals. May 27, 2016 St. Louis Cardinals sent SS Jhonny Peralta on a rehab assignment to Springfield Cardinals. May 20, 2016 St. Louis Cardinals sent SS Jhonny Peralta on a rehab assignment to Peoria Chiefs. November 24, 2013 St. Louis Cardinals signed free agent SS Jhonny Peralta. September 26, 2013 Detroit Tigers activated SS Jhonny Peralta from the restricted list. August 5, 2013 Detroit Tigers placed SS Jhonny Peralta on the restricted list. June 12, 2012 Detroit Tigers activated SS Jhonny Peralta from the paternity list. November 10, 2010 SS Jhonny Peralta assigned to Aguilas Cibaenas. November 8, 2010 Detroit Tigers signed free agent Jhonny Peralta. November 7, 2010 SS Jhonny Peralta elected free agency. July 29, 2010 Detroit Tigers activated SS Jhonny Peralta. July 29, 2010 Jhonny Peralta roster status changed by Detroit Tigers. July 28, 2010 Cleveland Indians Traded Jhonny Peralta to Detroit Tigers and West Michigan Whitecaps Traded LHP Giovanni Soto to Lake County Captains.